Learning a language can be an onerous activity – especially if you are in your garret reading your verb lists by candle light. I studied French for 4 years in high school and can barely buy bread in Paris. Italian wasn’t spoken to me at all – well pass the mapeen and sta zitta – but that was it. My first real brush with the language was after my first trip to Pontelandolfo – in a year when the dinosaurs roared in tongues over the earth. I was twenty-something and had come to visit the village of my heritage with my Aunt Catherine and two cousins. We assumed that since Aunt Cat was born here and left when she knew the language well that she would be our translator – NOT. She spoke the arcane dialect of Pontelandolfo. I knew we were in trouble when we landed in Milano and she asked a question to be told “we don’t speak Spanish here.” Thank the Universe I had a trusty Berlitz phrase book with me. 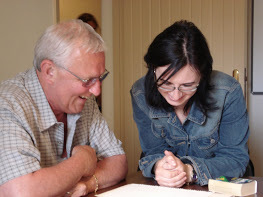 I played with learning Italian but didn’t get committed until 1999 – the year I returned to Pontelandolfo with my family tree in hand and found my dad’s first cousins. When I got home, I went to Brookdale College, Somerset County College and finally Dorothea’s House in Princeton. All experiences had their pluses and minuses. Next, to nudge Jack into learning the language I researched immersion schools in Italy. I would go to websites, send an e-mail and hear nothing. Or worse, I would call – all saying they were multi-lingual – and no one spoke English and could tell me about the place. Than I found Centro Mediterraneo Pintadera! 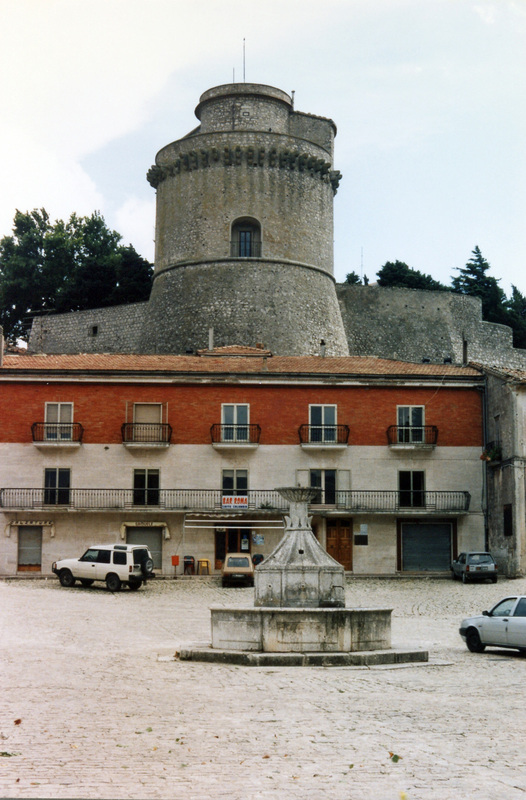 The school is located in Alghero on the magical island of Sardegna. I spoke with one of the directors, Nicola, and was assured that the classes were small – which they were capping out at about six people. She speaks multiple languages flawlessly. She told me about the teaching staff – think Ph’ds who aren’t yawners. The facility was up a flight of stairs in the heart of the old part of the city. That location puts the school in the middle of the art and culture that makes Alghero fabulous. It also means you are within walking minutes of the sea. When she told me the price – I was sold! On a sunny May day, Jack and I packed a notebook and pens and headed for Sardenga. The sea surrounds the city, May means fewer tourists and cheaper airfare. We were not disappointed in our choice of schools or the location. Why didn’t someone tell me when I was younger that studying language in the place the language was spoken not only makes great academic sense BUT – you meet really cool people. People who like to travel like we do – sans reservations, sans itinerary. Just go, explore and do! The people we met in our classes – Jack and I weren’t together – I was a bluebird and he was – well – on the little bus – anyway the people were GREAT. Jack is studying – but who – I mean what? We met two smart pithy women from Germany, a tall handsome Dutchman, and a really interesting guy who lived in Dubai but was from Tasmania! Instantly, we all bonded over caffè, were forced to speak Italian or – gulp- English. Since of course, everyone else spoke their language plus English. 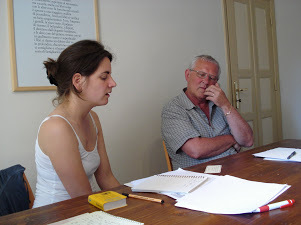 Since I can’t keep two languages going in my brain at the same time, the small full immersion classes worked for me. The faculty not only had advanced degrees in languages but I swear were all actors. You have to be a an actor to communicate with six wildly wicked adult students who want to learn your language but really don’t understand a spoken word. Jack gets personal attention from a great and talented teacher. The classes focused on both grammar and conversation. The homework did not make me pull out my teeth. Every moment was very interactive. No one wanted to put their head down on the desk and snore. Check Out Who Sings With the Professional Classical Group? – Yup, our teacher! Not only does the school have a great graded curriculum, but they made all of the living arrangements for us too. 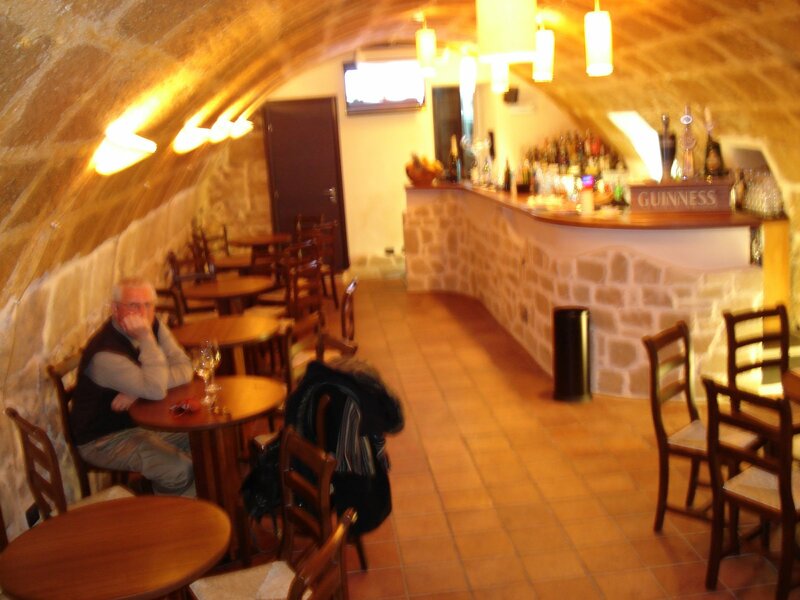 We rented a charming house for the two week course that was right in the heart of the historic center of Alghero. That meant close to world class bars, restaurants and shops. Our New Dutch Pal Cooking Dinner at Our House. In a great local joint with our new found school pals. Every morning, following the narrow cobblestone streets, we would walk to the school. 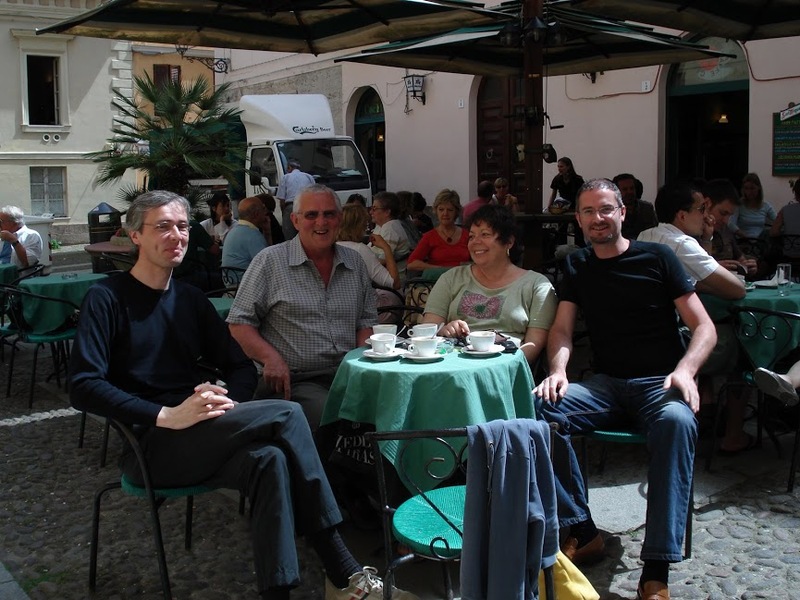 Classes ran for about four hours every morning – with a break to speak to the locals and have caffè. Then we would find a charming place for lunch, Jack would go for a walk and I would sit, stare at the sea, pretend to write and drink Prosecco. 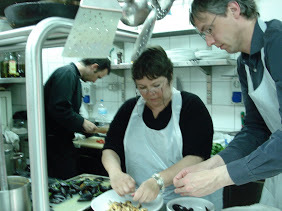 The school also ran cultural immersion classes I took a cooking class that was scads of fun. The hunky chef owns one of the local restaurants. 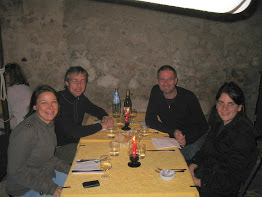 We started out shopping and then back to his kitchen to prepare a meal that we then ate paired with fabulous local wine. 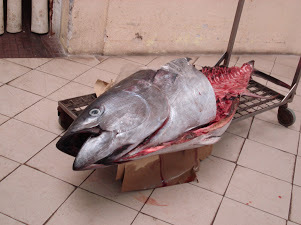 The Tuna Was Really Fresh! We Were Shucking and Yucking in the Kitchen. Jack and I were so in love with the place that I convinced pals from Dorothea’s House to come too. 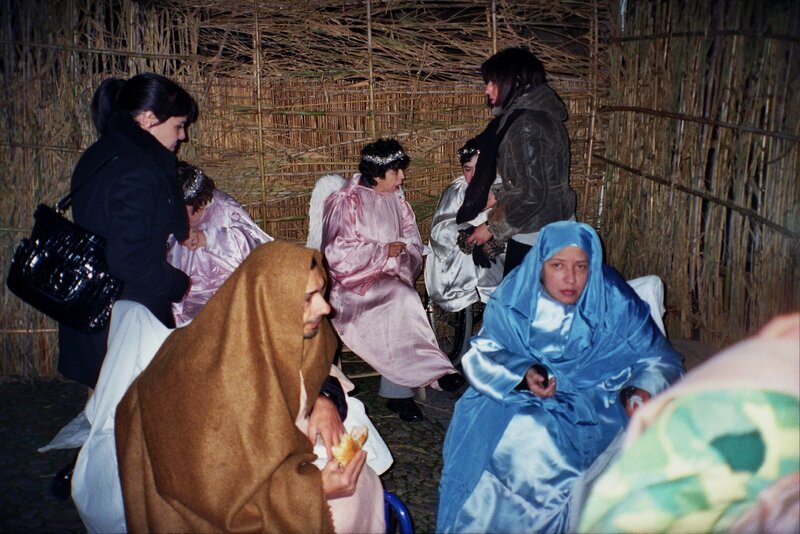 We went back one January – which means during Epiphany – the city was alive with holiday spirit and the staff of Pintadera made sure we knew what was going on and participated. 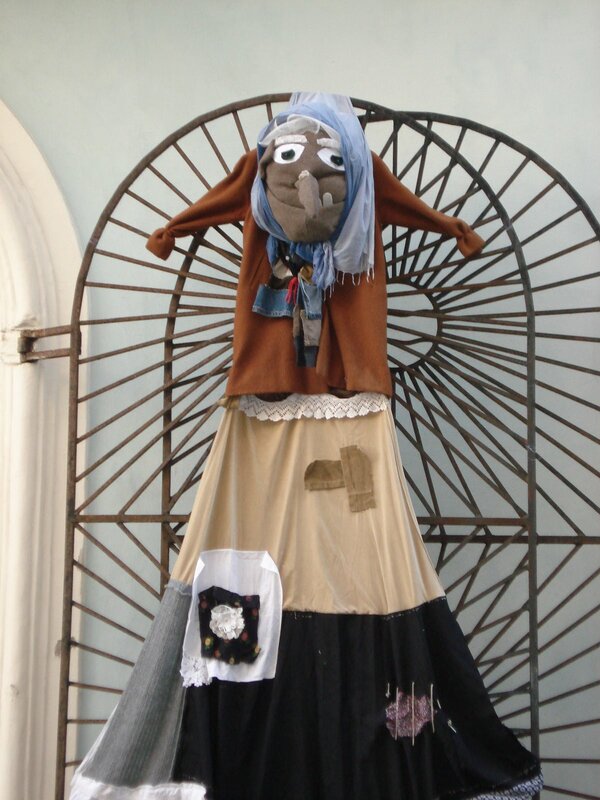 La Befana Was Everywhere! Even Lots of Women Dressed as La Befana! 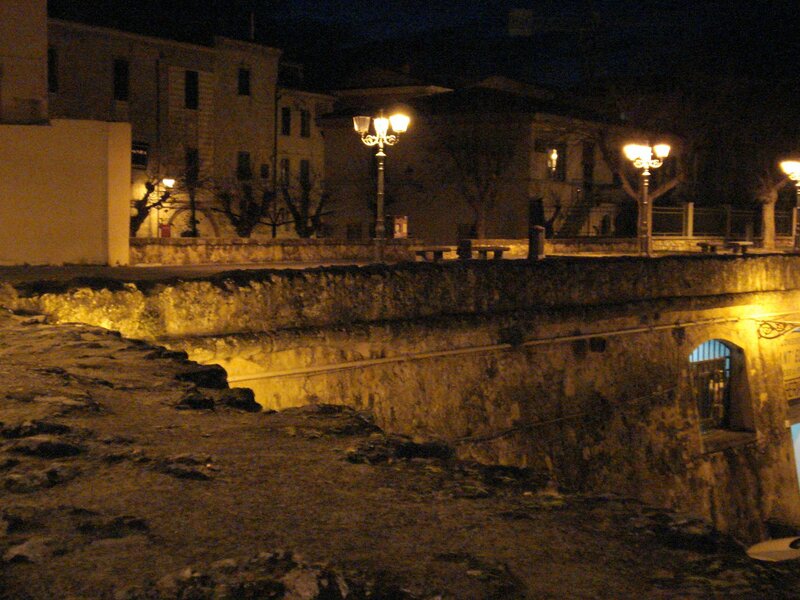 I would love to be in Alghero every January – anybody want to send me? Huge gangs of men dressed in black and sporting berets moved as one up and down the narrow streets singing in tight harmony. Children raced from one La Befana to another asking for treats. The spectacular theatre featured free live entertainment. The Living Manger Scene really touched me, the actors were all persons with disabilities who took their roles seriously and were applauded by all. There was so much to do and experience that sometimes “my dog ate my homework” for the next class at Pintadera. The extras that the school provided included a wonderful walking tour of the historic center filled with tales of the season. 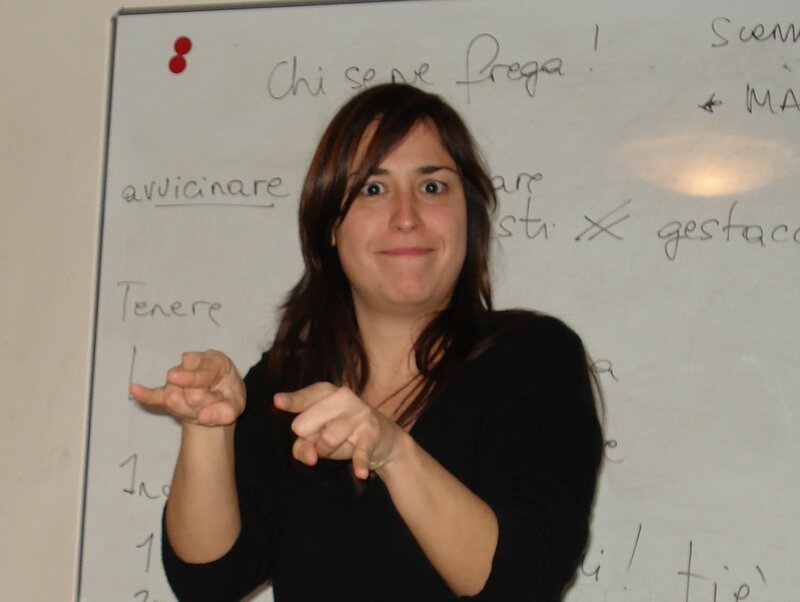 Another fun filled extra was a class on the use of your hands when speaking Italian. No – we did not learn how to flip the bird – that is not – OK maybe they do it – but it is not Italian. How About A Class in Italian Hand Speak! In May the city is filled with sun and walking on the sea wall is magical. In January it gets dark a lot sooner but walking on the sea wall is still magical. I felt like a princess wrapped in a cloak an walking the castle walls looking out to sea, waiting for my prince to return. There was so much life in the city during the holiday season that it was impossible to feel cold. Also, it wasn’t as cold in Alghero in January as it was in New Jersey. Sea Wall At Night! During the day I stared and stared. Next postNot In My Backyard! sounds awesome…I will go next time…I don’t mind being in the….baby bus!! I think Nonna’s Mulberry Tree should organize a trip! so do I! and thank you Midge for the wonderful heartfelt post. I love the spontaneity of your writing. I want to go,too! Let’s make it a family excersion. I am on the pre-k bus! H’mm – second person who said that. Nonna’s Mulberry Tree needs to organize a trip. I planned a trip to Sardegna this past May to stay with friends who own a house there, but life got in the way…I have always wanted to visit and have read extensively on the island. So…I’m the third person to say “organize a trip”! I will help! Whoa – the third person who wants a trip! I need to call Pintadera! I hope the school links to your blog, this will definitely help their marketing. Ho Ho let me know if you do organize a trip! We will let everyone know if we put a trip together. I think it would be a great idea!